Emory physicians represent 50 percent of the “Top Doctors” listed this year, with 358 physicians earning recognition. 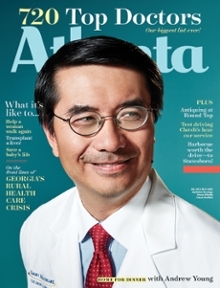 Winship Cancer Institute's own Hui-Kuo Shu, MD, PhD, a radiation oncologist, is on the cover of the magazine. Complete List of 2017 "Top Doctors"
Emory physicians are well represented in the 2017 "Top Doctors" issue of Atlanta magazine. Emory Healthcare physicians, Emory Healthcare Network physicians, Emory University School of Medicine faculty and Emory medical staff physicians represent 50 percent of the "Top Doctors" listed this year, with 358 Emory physicians out of 720 earning recognition in the publication. The July issue can be found on magazine stands across metro-Atlanta. "We are proud of our physicians, nominated for this honor by their peers because of their excellent clinical skills and care and concern they give to their patients," says Jonathan S. Lewin, MD, president, CEO and Chairman of the Board of Emory Healthcare. "As Emory Healthcare and its network of physicians continue to grow, our goal is to provide extraordinary health care, via our 'Top Doctors' and beyond, in all reaches of our state." To compile the annual "Top Doctors" list, Castle Connolly uses a survey and research process involving tens of thousands of top doctors across America and the medical leadership of leading hospitals. Atlanta magazine's "Top Doctors" are selected after peer nomination, extensive research, careful review and screening by Castle Connolly's doctor-directed research team. The magazine uses the research by Castle Connolly to provide detailed information about education, training and special expertise of Atlanta doctors. Doctors do not and cannot pay to be selected and profiled as Castle Connolly "Top Doctors."